An adult male Stejneger’s Scoter (Melanitta deglandi stejnegeri) could be photographed at Pinet beach, La Marina Coast, Alicante. This Asian White-winged Scoter (Melanitta deglandi stejnegeri) is the second record for Spain and is a real MEGA . 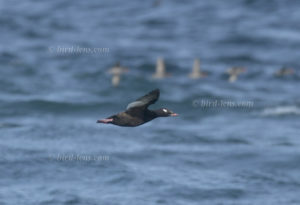 The bird was seen at least from the 6th of December at La Marina together with Common Scoter (Melanitta nigra), Yelkouan Shearwater (Puffinus yelkouan), Northern Gannets (Sula bassana), Shags (Phalacrocorax aristotelis) and Razorbills (Alca torda). The last Stejneger´s Scoter in Europe I heard from, was detected in Norway in Fauske, Nordland, where an adult drake was observerd at Røvika in July 2016 and a individual (maybe the same?) in June near Berlevåg, Finnmark.